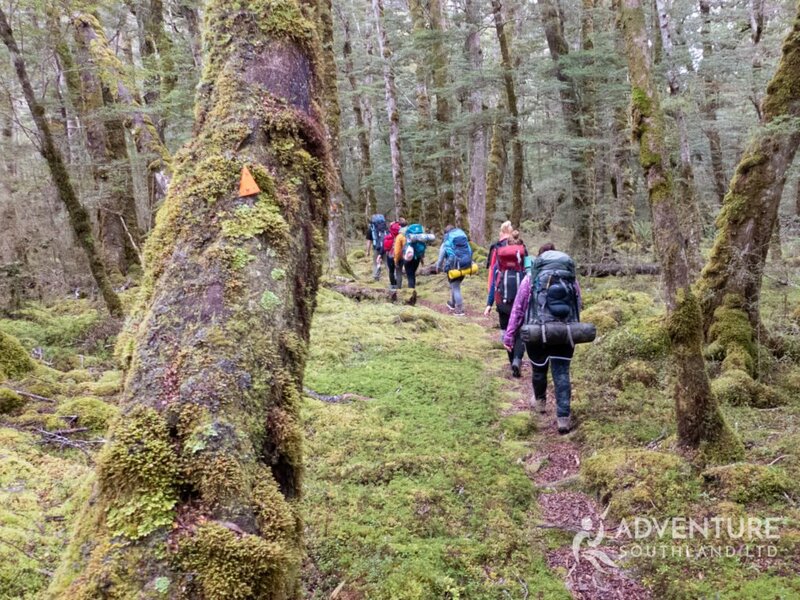 On 9-10 March, a group of women from across Southland ventured into Fiordland National Park for a weekend of adventure, skill building and fun. Women in the Wilderness was conceived as an experience run by women for women, with all female instructors and participants. The itinerary included a variety of outdoor activities to provide opportunities for women to try something outside of their comfort zone, build relationships and be empowered through learning new skills. The group met with two instructors from Adventure Southland Ltd at Borland Lodge. After distributing the chocolate throughout the group and tightening the pack straps, it was off to our first adventure. About 6km up the road from Borland Lodge is a 25m abseil site and climbing crag. We donned harnesses and helmets, and with a bit of encouragement the whole group dropped gracefully over the edge of the cliff. After warming up on the first go some were keen for a more adventurous second attempt, bouncing off the rock and doing their best Spiderman impressions. The track back up was steep but well-marked, and soon we were scaling the rock wall opposite the abseil. The instructors had set up 3 top-rope climbs at a variety of grades for us to try. It was great to see people with less experience achieving something that had seemed impossible. Now that we were warmed up (and noticing a few new muscles) and it was time to begin the tramp in to our campsite for the night. We started off on the South Borland track. The terrain was steep in places and there was a lot of scrambling over tree roots, but we came to some impressive bluffs where we stopped for a quick bushcraft lesson. We had a few other quick lessons along the way, identifying different native trees and their uses, reading maps and navigation. After a few hours of walking we made it to the Rock Bivvy where we would camp for the night. The packs were quickly dropped and the group set off to find firewood for the night. The weather had been fine so finding dry wood wasn’t too much of a challenge. Justine gave us a lesson in fire lighting and we succeeded in keeping it going throughout the evening. The dinner menu was quite diverse, with a range of great options from Back Country Cuisine. The group quickly mastered the gas cookers and a few off us went in search of marshmallow roasting sticks while waiting on our meals to cook. There’s nothing better than a hot meal at the end of a long day. We spent the rest of the evening cooking damper and roasting marshmallows around the camp fire. It was an early night for most of the group. Everyone stayed warm in their sleeping bags under the shelter of a huge overhanging limestone rock. There is a wooden platform for sleeping, but without a thick bedroll it’s not the most comfortable, so there were a few stiff bodies the next morning. We rose with the sun and after a quick breakfast, it was time to repack and set off back to Borland Lodge. Our return route was slightly longer but included a second swing bridge which was a hit! Along the way we had a few more quick bushcraft lessons and some of the group were keen to try Horopito leaves, a feeling that dissipated much quicker than the after-taste of the peppery tree. After lunch at the Lodge, we reconvened at the Clifden Caves and once again donned helmets, harnesses and headlamps to explore underground. Our two instructors were a wealth of knowledge on the formation, conservation and exploration of the cave. We entered at the middle entrance and made our way through to the bottom section, accessible only by a 7.5m abseil into a pool of water. Some of the group required a fair amount of encouragement, but we all waded through chest deep water to the sump. Three of the group were even brave enough to swim through freezing water to the very end of the cave. Caving certainly was a highlight of the trip, with everyone overcoming the difficult terrain and some mental challenges too! Overcoming challenges was a recurring theme throughout the weekend, whether it was pushing through the wall to keep going with a heavy pack, facing fears on the 25m abseil, or going out of your comfort zone in the caves. The group stayed positive and were supportive throughout the weekend which was encouraging to see. Hopefully we’ve added some keen new members to our outdoors community in Southland!